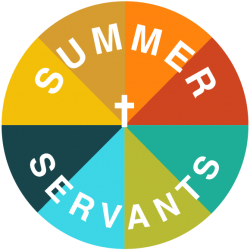 Our 2018 Summer Servants Internship Program was a huge success. Thank you to our interns for everything you did! Also, thanks to staff and leaders at Hopeprint and Brady Faith Center for co-leading a social justice intensive training week. Thank you to McMahon/Ryan Child Advocacy Center, Centerstate CEO, and the Allyn Family Foundation for your participation as well. Click on the banner below to view and complete our application for Summer 2019! – Each person is expected to be excited to grow in their faith in Jesus Christ, and excited to serve in specific roles which further His kingdom in the lives of teenagers. – Each Position is a paid position. This person will work closely with the Camp Manager to plan and run the spiritual components of camp, which include a daily devotional, morning program, prayer rituals, worship (musician or other form), and Interactive prayer or spiritual experiences. You will also work closely with the Activities Director to run small group time each day to encourage reflection and conversation for the teens about their camp experiences. This person should have an understanding of teenagers and their culture and experience in sharing the Christian faith with them. You should also have great public speaking and programmatic planning skills. This person will be in charge of choosing, planning and running ice breakers, daily group games, night programming and rec night activities. You will be upfront and expected to command the attention of large groups of teenagers. You will choose the music for free-time and games. You will organize free time activities, run small groups each day with the Spiritual Minister Intern. You will organize and set up supplies needed for each game or fun activity. This person should have excellent public speaking skills, experience in youth ministry, timeliness and enthusiasm. This person will be in charge of taking photos and videos during the week, and using them to create usable products. You will be able to experience all of camp- homesite activities and worksite activities. You will be expected to visit the worksites during the day. You will have a flexible schedule, but you will need to capture beautiful moments at camp and at the worksites. You will create a sharing method so that adult leaders can share their photos with you. Each day you create photo presentations that highlight the day, or a specific worksite and set it up for viewing at appropriate times. During the week you will work to create a video. At the end of two weeks you will combine your photos and video to create a promotional video for the next summer. Every intern will be expected to act responsibly and collaboratively with the team, engage with teenagers from different churches, share your faith and life-story, perform your job responsibilities and have fun!